Bangladesh Telecommunications Company Ltd. BTCL Job Circular 2016 | www.btcl.com.bd. Bangladesh Telecommunications Company Ltd has published a job circular on 20 April for the post of junior assistant manager and accountant. Total 120 candidates will be recruited for those post. Eligible candidates have to apply through online. Job Description: Bangladesh Telecommunications Company Ltd is looking for a few young, skillful, creative and self-motivated individuals. Educational Qualification: Honours in Accounting with M.com/MBA/MBS from any authorised university. Compensation and Benefit: According to the post. 3) Upload your photo of 300X300 pixel not more than 100 KB and signature maximum 300X80 pixel not more than 80 KB. This application should be sent within 15 May, 2016. Like Our Facebook Fanpage facebook.com/resultnotice to get the latest updates of BTCL Job Circular 2016 and get further updates. 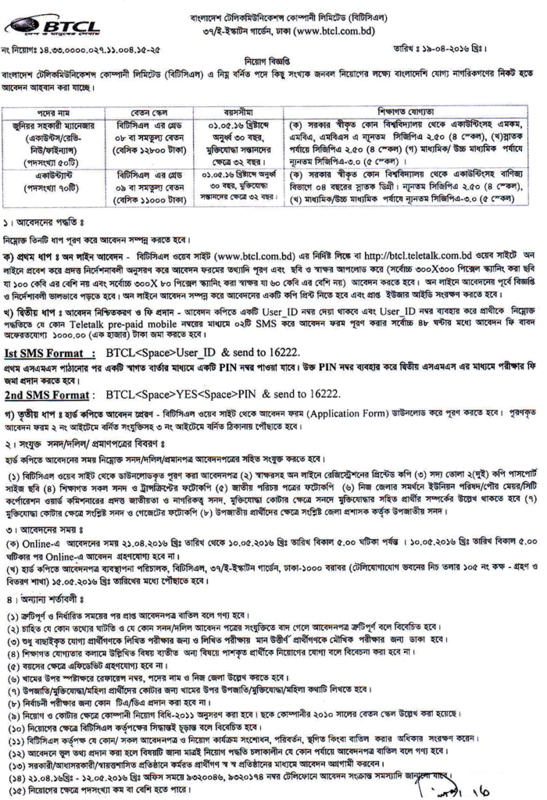 This entry was posted in Job, Job, Job Circular, Notice and tagged Bangladesh Telecommunications Company Ltd. Job Circular 2016, BTCL Exam Result, BTCL Exam Result 2016, BTCL Job Circular, BTCL Job Circular 2016, http://btcl.teletalk.com.bd/, www.btcl.com.bd by Result Gov BD. Bookmark the permalink.